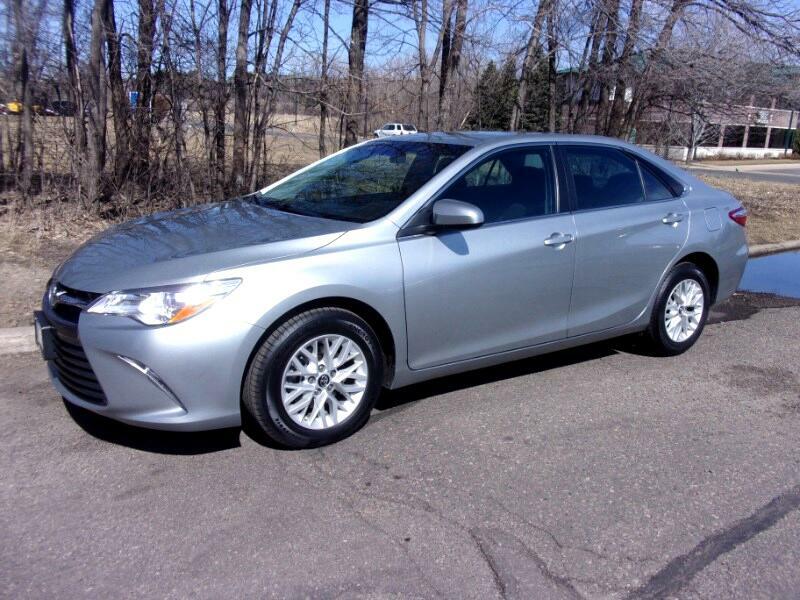 Used 2016 Toyota Camry LE for Sale in Vadnais Heights MN 55110 Integrity Autosource Inc.
CARFAX CERTIFIED ACCIDENT FREE HISTORY. STILL COVERED BY TOYOTA FACTORY WARRANTY. A VERY NICELY EQUIPPED LE MODEL WITH POWER DRIVER SEAT, POWER WINDOWS, LOCKS AND MIRRORS, BACK UP CAMERA, BLUETOOTH, KEYLESS ENTRY AND MORE. MECHANICALLY INSPECTED AND UP TO DATE ON MAINTENANCE INCLUDING NEW TIRES. WE TAKE TRADE INS AND HAVE GREAT FINANCING TOO. IN BUSINESS IN THE SAME LOCATION SINCE 1996. THERE IS TREMENDOUS PEACE OF MIND KNOWING THAT THE USED CAR YOU ARE PURCHASING HAS BEEN THROUGH A MECHANICAL INSPECTION. EVERY ONE OF THE VEHICLES YOU SEE LISTED ON OUR WEBSITE HAS BEEN INSPECTED AND SERVICED. WE HAVE THE INSPECTION REPORTS TO PROVE IT! WE DON'T BELIEVE IN JUST DOING A MINOR SAFETY INSPECTION EITHER....ALL FLUIDS ARE CHECKED AND CHANGED IF NEEDED, BRAKES CHECKED AND REPLACED IF NEEDED, TIRES CHECKED FOR TREAD DEPTH AND REPLACED IF NEEDED, SUSPENSION COMPONENTS, BELTS, HOSES, AIR FILTERS....EVEN THE WIPER BLADES! DRIVE AWAY WITH CONFIDENCE IN ANY OF OUR VEHICLES, NO MATTER WHAT PRICE RANGE IT'S IN. IN BUSINESS IN THE SAME LOCATION FOR 21 YEARS! DO A GOOGLE SEARCH AND READ OUR REVIEWS ANYWHERE YOU CAN FIND THEM AND YOU'LL SEE THAT WE TAKE VERY GOOD CARE OF OUR CUSTOMERS. WE'RE MORE INTERESTED IN A LONG TERM RELATIONSHIP THAN A QUICK SALE. Message: Thought you might be interested in this 2016 Toyota Camry.